Sometimes, against all odds, you get a do-over in life. A shot at an opportunity you never had, or maybe wouldn’t have been ready for anyway. 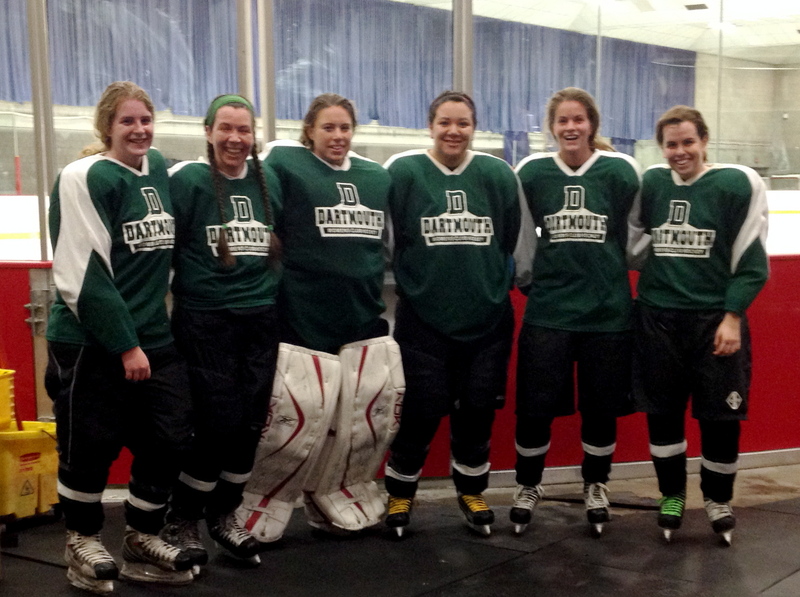 I got just such a chance this year on the Dartmouth College Women’s Club Hockey Team. 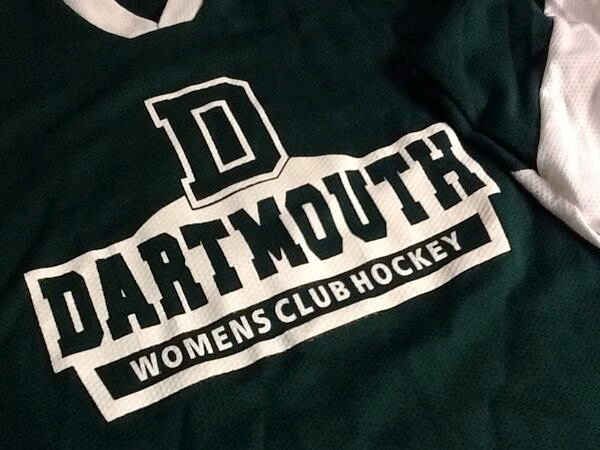 Due to a dozen players studying abroad last fall (a quirky result of Dartmouth’s D-Plan), the Women’s Club Hockey team was reduced to 7 players. And, since Dartmouth’s Club Sports are open to students, faculty & staff, I’m eligible. So, at 43 years old, I got my chance to play competitive hockey with women less than half my age in games against Harvard University, Endicott College (recap here), and the University of New Hampshire. The highlight, though, was our away game against MIT in Boston. ROAD TRIP! 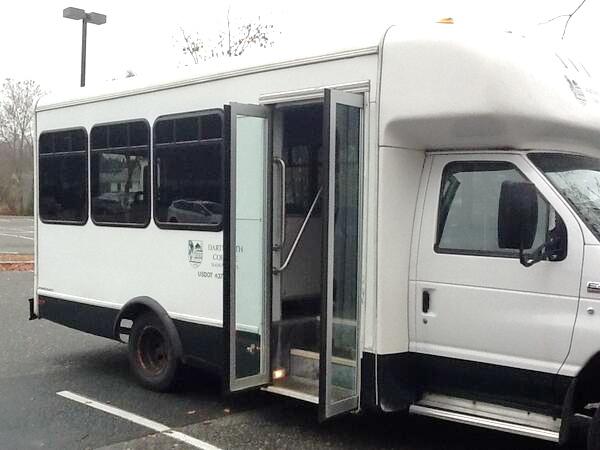 Shipping down to Boston on the team bus. With just 5 skaters (and a goalie), our club team boldly took on their full roster of 17 skaters (plus 2 goalies)… and TIED! We skated with NO SUBSTITUTES and found ourselves scoreless after 3 fifteen-minute periods. Five more minutes of intense effort, and still no one scored. When the final buzzer sounded, we celebrated the unlikely result, giddy with exhaustion. See that scoreboard in the upper right? It says 0-0, baby! It was the most improbable outcome in the most improbable game I have ever played. And I am so grateful I had the chance, grateful that these talented young women welcomed me on their team with open hearts. 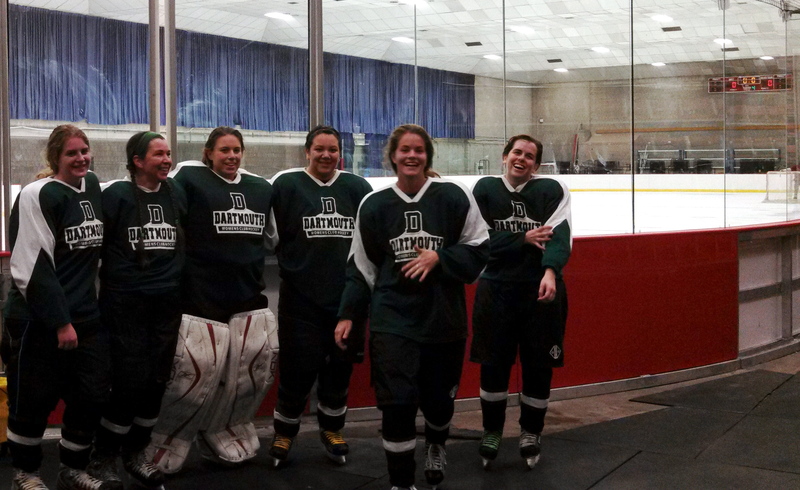 The Dartmouth Women’s Club Hockey Team, exhausted but giddy with our tie game. I live in a hockey-crazy corner of New England. Within a 50-minute drive of my house there are 6 ice rinks, not to mention the many frozen ponds that grace the Upper Valley. For seven months a year, I play an average of 10 hours of hockey per week, with the opportunity to play many more. It’s my idea of Hockey Heaven. 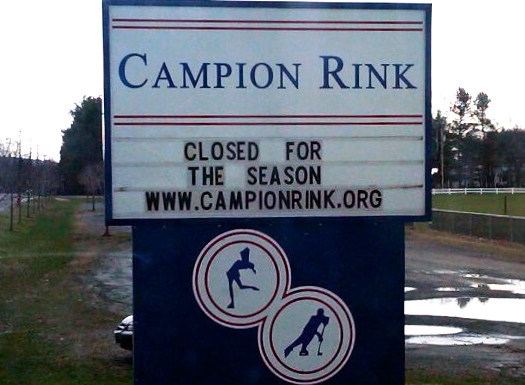 But, somehow, bewilderingly, there are NO year-round rinks here in the Upper Valley. My rinkrat paradise is seasonal. Come April each year, I begin to dread the day they turn off the compressors and let the ice melt. Just as the rest of New England is rejoicing at the return of warmer weather, I am suddenly cut off from my favorite activity. Just like that. Cold turkey. It’s worst in the first week. I am restless, listless. I am antsy, unable to focus and vaguely irritable. I am deep in the throes of hockey withdrawal. Within my hockey circles, no one doubts that hockey withdrawal is real. 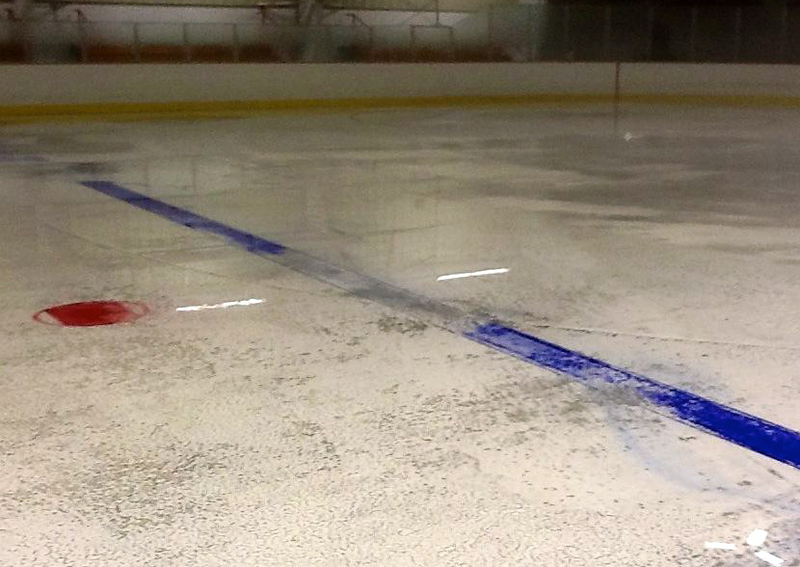 We all search for some combination of “off-season” activities that never quite seem to fill the place of hockey. It’s not just missing the game itself, which is, arguably, the most fun game ever. There’s the resulting decrease in feel-good endorphins, since it’s hard to maintain 10 hours of activity per week if it feels more like work and less like play. There’s the disruption of my routine, leaving huge holes that I don’t have energy to fill. 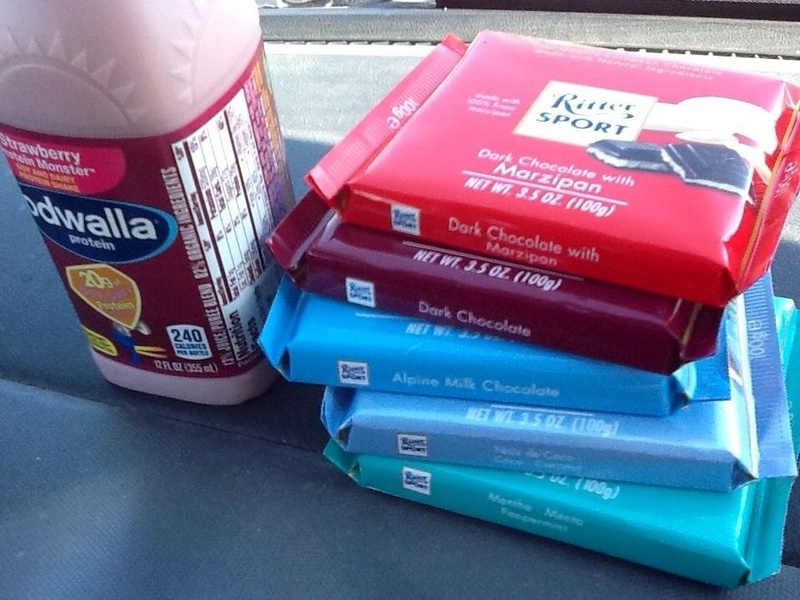 Playing hockey 10 hours/week means I can sneak in some extra chocolate in season. There’s the disheartening need to change my diet to reflect reduced caloric needs, or else risk gaining 10-20 pounds, easy. I like food. Playing lots of hockey requires me to eat lots of food. It’s hard to dial back my eating habits. Most of all, though, there’s the loss of community. Hockey is a team sport. 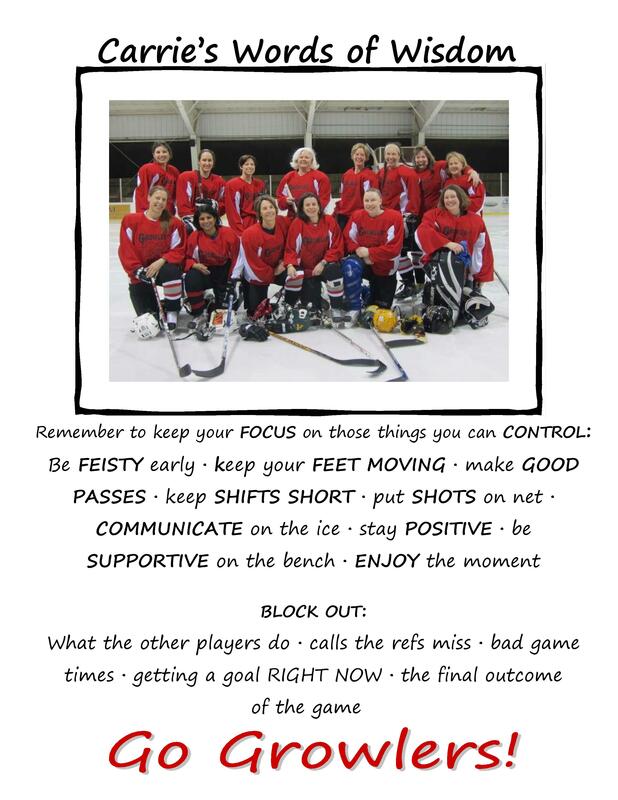 You need hockey buddies to pass the puck & make plays with. You need hockey buddies to score against. 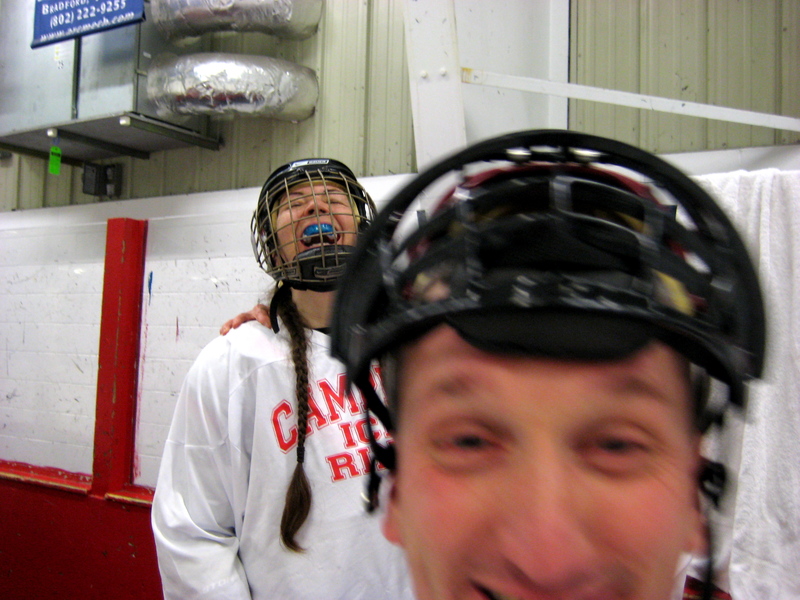 Team Red of Campion Rink’s 2013 April Showers mini-tournament. It’s a social game, with unique communication happening often wordlessly on the ice. Plus, plenty of antics and banter from the bench. 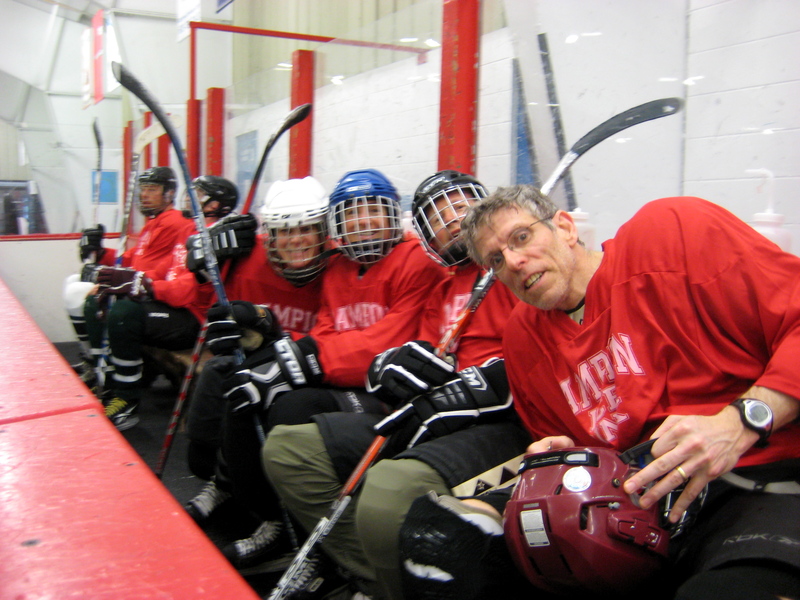 Coach Pollard perfects his photobomb technique at the rink! 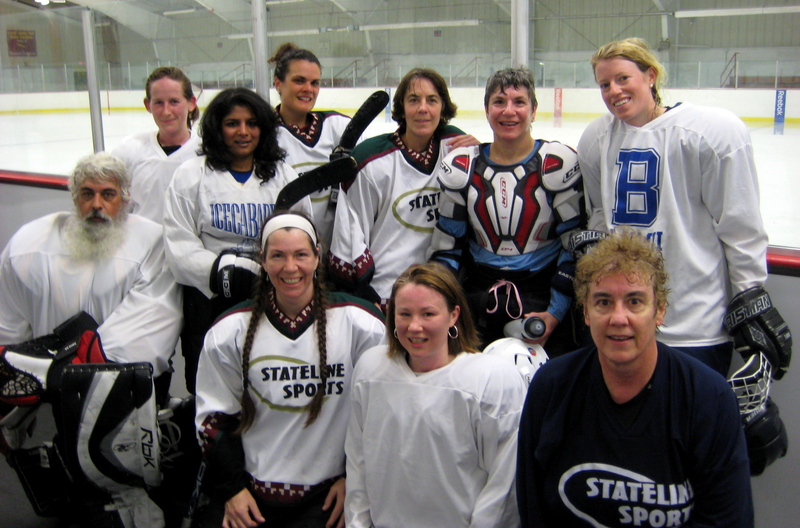 Thankfully, I’ve got one last hockey hurrah this weekend: a women’s tournament with my Growlers team up in Burlington, VT.
One last, sweet taste of hockey before the long drought of Summer. And I intend to savor every last drop of it. What about you? How do YOU handle hockey withdrawal?? 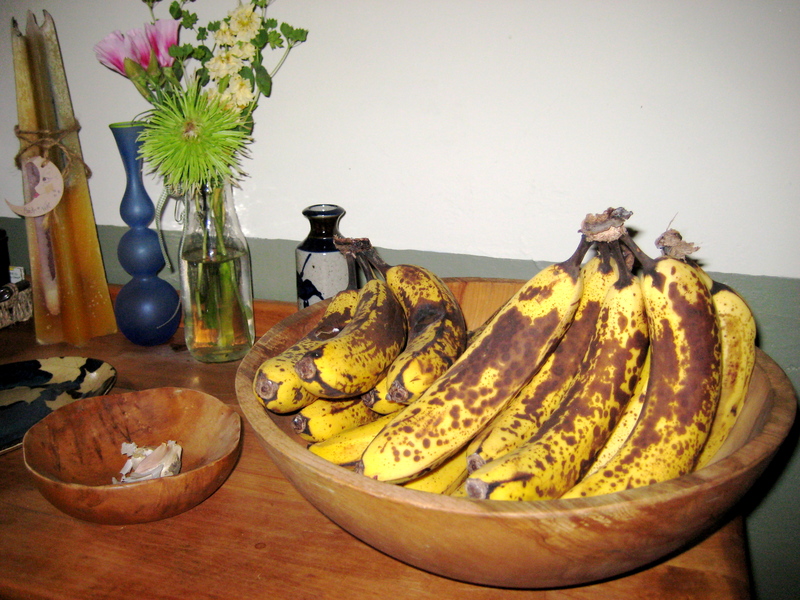 Never waste over-ripe bananas again. These are perfectly ready for baking. 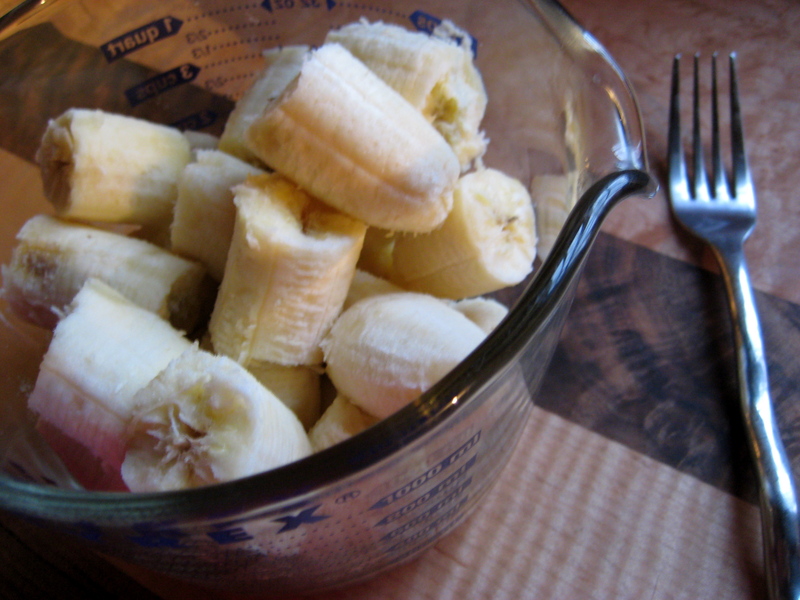 Ripe bananas are easy to mash with a fork. That’s Angie: Back row, 2nd from the right. It was delicious! Angie kindly gave me her original recipe, which I tweaked to get in a little more whole wheat & fiber. 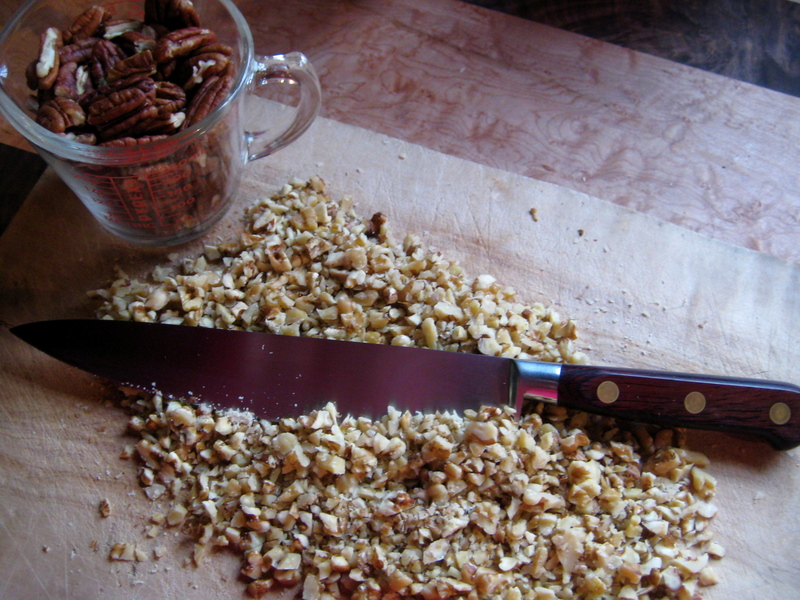 Plus, I added nuts. Lots of nuts. 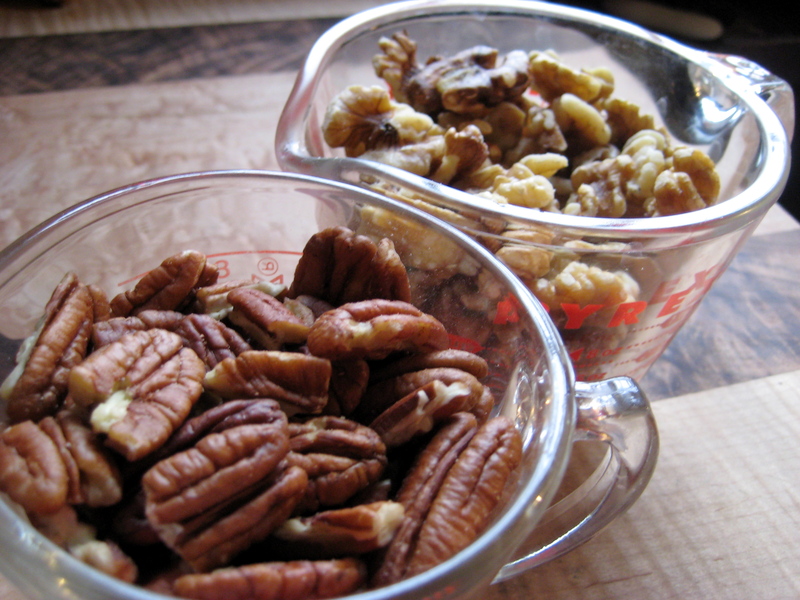 Pecans & Walnuts add welcome protein to this yummy quick bread. 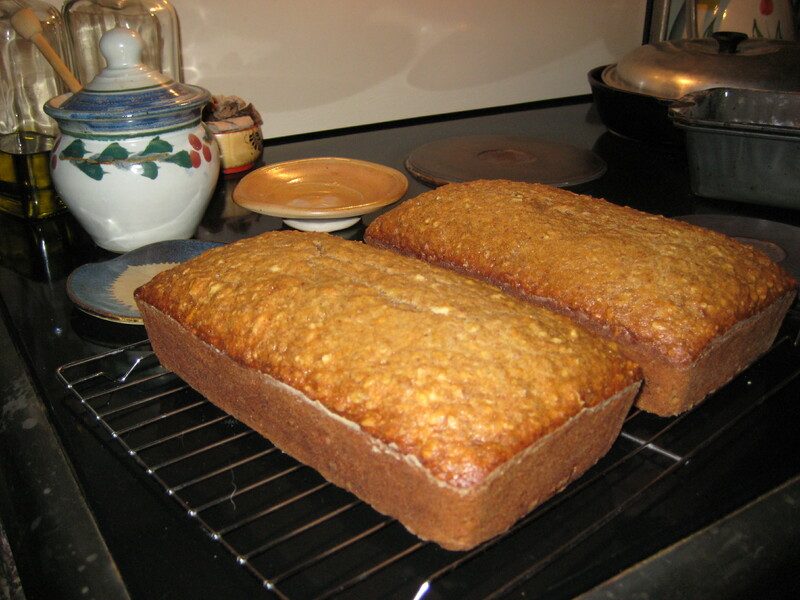 Finely chopped pecans and/or walnuts lend a toothsome texture to banana bread. Now, when I need a healthy, yummy snack to go with my post-skate chocolate milk, I reach for a slice of this banana nut bread and am grateful for rink-buddies & the chance to play the best game on Earth. Loaves are fully cooked when golden brown & slightly cracked on top. 1. Preheat oven to 325F degrees. Grease & flour 2 loaf pans. 2. In a large bowl, beat together eggs, sugar, oil & vanilla. 3. In a 2nd bowl, combine dry ingredients. 4. Add dry to wet ingredients & mix well. Fold in bananas & optional nuts. 5. Pour into prepared pans & bake 60-70 minutes. 6. Remove from oven when fully baked in the center. Cool 5 minutes then remove from pans & allow to cool fully on wire rack. 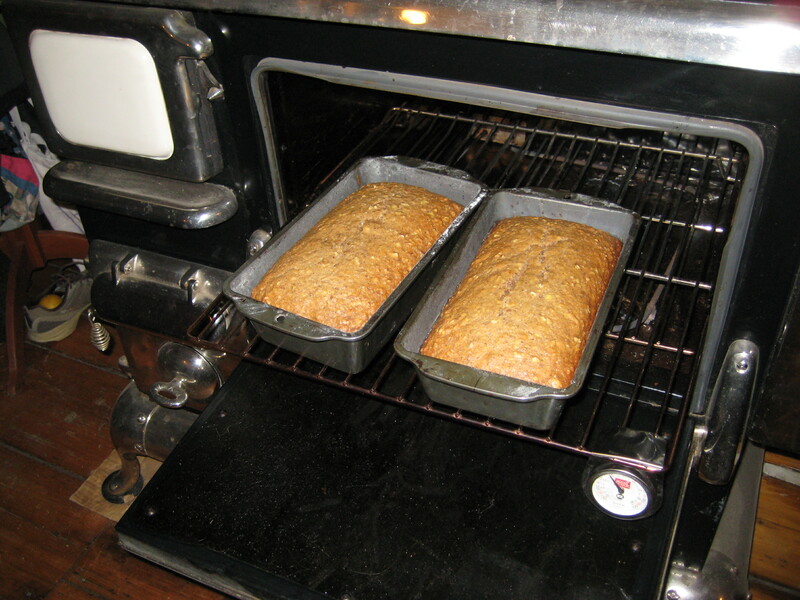 Fresh loaves of banana nut bread cooling on a rack.